Please jo in Kathleen Guilday and Laurel and Sarah Martin for an evening of traditional Irish and Scottish music. An All-Ireland harp champion, Kathleen Guilday has appeared at Boston’s Symphony Hall with The Chieftains, and entertained President and Mrs. Clinton and Irish Prime Minister Bertie Ahern at the White House on St. Patrick’s Day 2000. Kathleen teaches harp at the Comhaltas Ceoltóiri Éireann music school in Boston. Laurel Martin’s fiddling is colored by the intricate ornamentation and rhythmic bowing characteristic of the old musicians of Clare, East Galway and Sligo that are her musical influences. Laurel, who studied with Master Irish fiddler Séamus Connolly, was an instructor for the Boston College Irish Studies program from 1994 until 2007 and currently teaches at the Indian Hill Music School in Littleton, Massachusetts. Laurel has released two solo recordings, The Groves and Larks & Thrushes, and a book and CD set Forget Me Not: Fifty Memorable Traditional Irish Tunes. Both Laurel and Kathleen are members of the renowned Childsplay fiddle ensemble. Sarah Martin grew up in a house full of music. Trained as a classical violinist and violist, Sarah has gradually moved towards traditional Irish fiddle music. Sarah also loves singing, composing and playing guitar, and in 2010 she released an album of her own songs, In-Between Lullabies. During intermission enjoy our homemade desserts and fair trade beverages. Hope to see you there! If you are interested in performing, you must sign up in advance. Please email Art Grossman at NRCoffeehouse2gmail.com. The first 14 signups are guaranteed a spot. We need to do this to keep the event to three hours. Thank you. Always entertaining and always someone to sing along with. Learning ukulele as a 10-year-old in Hawaii morphed perfectly into JT and Joni on guitar when back in New England in his teens. His own songs show he was born and raised singing along with Pete Seeger. Sharing songs took him from coffeehouses in Chelmsford and Harvard Square to Greenwich Village, Nova Scotia, and London, too. His first CD shows folk roots – simple voice and guitar, and his second, polished by Wlifred Raterink, his Dutch friend and songwriting partner. You’ll be encouraged to join in enjoying a cheerful mix of originals, covers, and traditional songs. Tickets $20 each. Kids 18 years and younger, $10. Tickets available at the door, cash only. Advance registration available on our website http://newmooncoffeehouse.org or by calling (978) 459-5134. Martyn Joseph is a completely unique and mind blowing artist. Take everything you think you know about singer songwriters.and rip it up. For one man and a guitar he creates a performance with a huge far-reaching sound that is energetic, compelling and passionate. Be it to two hundred people or twenty thousand, he blows the crowd away night after night. In addition to his 5 top 50 UK hits, the importance of his work has been recognized by programmes such as BBC Radio 2s primetime series on Singer/Songwriters. Social justice has an essential presence throughout his music, which has been recognized with various humanitarian awards and plaudits. Concerned with making music that is relevant and vital to his audience, he engages with challenging narratives tackling the complexity of the human condition, underpinned with a promise of hope. In his own words Really what I do is to try and write songs that might step up and make some sense of a moment in time. A good song makes you feel like you’re not alone in the world. There is a versatility to Martyn’s music that is hard to categorize. Many have tried, resulting in labels such as Folk, Rock, Soul, Folk Funk and Americana; all of which somehow miss the mark. But sometimes music doesn’t need a defining genre and with the ability to articulate a sense of the bigger picture, Martyn’s music and social commentary manage to empower and speak for many. His songs are pictures, and stories, and feelings all put to music and delivered by a master craftsman. 2014 saw him take the spirit of his music onto a more practical footing with the launch of his Let Yourself Trust, a not-for-profit organisation which aims to make a small difference out of great love and commitment by challenging injustice wherever its found, educating via advocacy, campaigning for human rights, and raising issues that have been forgotten or ignored via fundraising initiatives, thus bringing about greater awareness for beautiful people in powerless situations. He’s also Patron of Advantage Africa and Festival Spirit in the UK and Project Somos in Canada/Guatemala. He has won the love of audiences from USA and Canada to Europe through an impressive number of live dates and has previously toured with the likes of Art Garfunkel, Jools Holland, Ani DiFranco, Suzanne Vega, Mike and The Mechanics, Joan Armatrading, Celine Dion and Shirley Bassey. He is hailed as a raconteur weaving tales on topical concerns, as well as stories on the fragility of love, with a magical ability to reach out to his listeners through his passion and humor. Stunning reviews single him out as an unmissable solo performer whose music stays with you long after the show has ended. 2016 was one of Martyns busiest, playing over 170 shows worldwide, he was also asked by the EFDSS and British Parliament to write and perform as part ofSweet Liberties with Nancy Kerr, Sam Carter and Maz OConnor to mark 800 years of British democracy, One of his songs from this, Nye celebrating Nye Bevan, the author of the NHS, has been enthusiastically received by audiences everywhere, as well as having BBC national airplay on Mark Radcliffe’s Folk Show and Tom Robinsons 6 Music show. Martyn Joseph. A unique talent driven by passion and love for his trade continues to write, sing and play from the heart. Its a road he’s been traveling for most of his life and, as he often tells his audience, you keep turning up and so will I. An acoustic singer/songwriter duo based in Duluth, Minnesota. Touring nationally, audiences feel they are listening to stories of their own lives, told by two of their best friends. Greg Brown’s first professional singing job came at age 18 in New York City, running hootenannies at the legendary Gerdes Folk City. After a year, Brown moved west to Los Angeles and Las Vegas, where he was a ghostwriter for Buck Ram, founder of the Platters. Brown’s songwriting has been lauded by many, and his songs have been performed by Willie Nelson, Carlos Santana, Michael Johnson, Shawn Colvin, and Mary Chapin Carpenter. He has also recorded more than a dozen albums, including his 1986 release, Songs of Innocence and of Experience, when he set poems of William Blake to music. Originally from Richmond, VA, Greg Greenway moved to Boston for its rich Folk Music tradition and has become one of its most unique and superlative emissaries. His “In the Name of Love,” a lead in to the U2 classic, “Pride,” was the #5 song on the Folk DJ list in 2013. It has become a defining piece on his journey to becoming an international artist capable of addressing sensitive topics like Race in a way that connects audiences to their humanity while entertaining them at the same time. From the end of 2010 to the present, Greenway has been one third of one of the most successful Folk trios in North America, Brother Sun. Greenway is also involved in a new project with long time friend, Reggie Harris. Reservations are required! HouseConcerts@fssgb.org. Admission is $20 for this event, or $35 total if you attend this workshop and the Windborne house concert the same evening (in Brookline). Windborne is comprised of local folk singers Jeremy Carter-Gordon, Lynn Mahoney Rowan, Will Thomas Rowan, and Lauren Breunig. 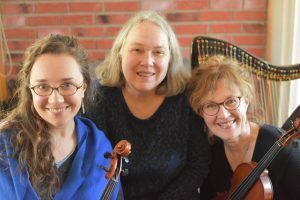 All four were nurtured in the tight-knit, far-reaching New England folk music and dance community, which provides no shortage of mentoring and inspiration as well as opportunities to develop and showcase one’s talents. Jeremy, Lynn, Will, and Lauren all come from families actively involved in folk music and dance, and who passed along their love of those traditions to their children. And these four young people took it all to heart and have made something all their own, while retaining a deep respect for the music and what it represents. There is breadth as well as depth to Windborne’s reverence for folk music. They can call up songs from the British Isles or American folk traditions, and their repertoire also extends to Corsica, the Republic of Georgia, Quebec, Bulgaria, the Basque region of Spain, and other parts of the world. And they’re folklorists as much as they are folk singers: Not only do they sound perfectly comfortable and natural – without affectation or histrionics – in performing the songs, no matter the origin, they are able to explain the nature of these various kinds of music and the cultures from which it emerged. But there’s another, crucial dimension to Windborne. They are adherents to folk music’s longtime association with social activism, in particular its ties to the labor and civil rights movements and others that champion the poor, the working class, and the disenfranchised. Furthermore, Windborne sees its mission as education, not simply performance: They have given workshops and classes around the world in singing and vocal techniques, all the while putting the songs they teach in full historical and cultural context. In addition to performing concerts worldwide, Windborne has taught workshops in schools, community centers, singing camps, and universities for the past decade. Experienced teachers and song-leaders, they delight groups young and old, large and small, with enthusiastic, clear, and nuanced instruction and get groups singing in harmony in no time! Participants of all abilities will learn singing styles from around the world as well as songs of social struggle from movements past and present. All songs will be taught by ear, no experience required (just enthusiasm and willingness to try new things! The workshops are a great opportunity to connect communities, sing out, and gather inspiration and energy from the music of past movements. They educate as they entertain, telling stories about the music and explaining the characteristics and stylistic elements of the different traditions in which they sing. Windborne strongly believes that singing is powerful—in communities, as performance, with friends, or with strangers. Today it is important that this power is something that we consider—that we can draw upon in other parts of our lives. Music and art are not neutral; songs can give a voice to those who have none, and has the ability change hearts, even when minds are made up. Come and sing out! Our Amazing Things Folk Open Mic offers a friendly supportive venue for developing singer-songwriters and folks who “just like to play”. It is a great way to get to know the music community, and to share ideas and techniques. All types of music are welcome. Fans come to see fantastic local artists, and never go away disappointed. See and be seen – heck build a fan base! Always a feature, always fun. Our host, singer-songwriter Dan Cloutier takes excellent care of the performers and listeners alike. A beautiful baby grand piano is available too. Advance tickets are $10. Visit the website at oldsloopcoffeehouse.org, John Tarr Store in Rockport, or The Bookstore of Gloucester. The suggested contribution at the door is $14 for adults, $9 for those 65 and older, $5 for those under 18, and $28 for families. 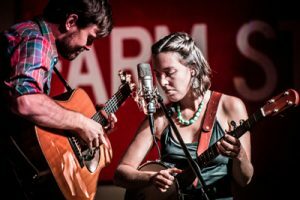 Laura Wortman and Kagey Parrish are The Honey Dewdrops: an award winning, internationally touring husband and wife folk duet who perform fresh, original songs focusing on vocal harmonies and tight instrumentation. Influenced by traditional Appalachian music as well as contemporary singer-songwriters, the Honey Dewdrops blend old styles with new, creating music that is powerful and heartfelt. Mark Mandeville and Raianne Richards are inheritors of a timeless legacy, creating music that is both original and evocative of a rich tradition. Blending distinctive voices and a wide range of accompaniment (guitar, harmonica, ukulele, clarinet, penny whistle, electric bass), their songs have been well-received by audiences around the eastern United States and Canada since 2010. Coffee, tea, and a variety of delicious (and very popular) home-made baked pie and cake will be sold before and after the concert and at intermission. The Linden Tree Coffeehouse concludes its thirty-fourth season on Saturday May 4 at 8 pm. The Early Mays is a trio based in Pennsyvania comprised of Emily Pinkerton, Ellen Gozion, with Nicole Myers. They feature water-tight harmonies over fiddle, banjo, cello, guitar, and harmonium. And as a special treat, the group will have crankies, an old storytelling form, sometimes called moving panoramas to complement story songs. Emily Pinkerton, Ellen Gozion, and collaborators carry their unique creative voices—and carefully honed craft—with them as they explore American traditional music with the band. Emily weaves folk, classical and world music threads into in her songwriting, and recently released a chamber piece for old-time banjo (Rounder Songs) on New Amsterdam Records. Now on faculty at The College of Saint Rose, she’s delighted to teach songwriting and composition in on of the country’s top Music Industry programs. Ellen is an accomplished ballad singer, accompanist and visual artist; she founded the Pittsburgh Crankie Fest and has taught workshops at the Augusta Heritage Center and throughout the the Mid-Atlantic. Her song, “Narrows of the Year” was an award-winner at this year’s Mid-Atlantic Songwriting contest. Joining the band this year is Nicole Myers—a genre-crossing cellist and founding member of Cello Fury. With Nicole’s rich and rhythmic playing, The Mays have added lush textures to their favorite songs from “Chase the Sun,” as well as chilling new arrangements of field hollers, North Carolina ballads and Carter Family classics. In The Early Mays, you won’t find a lead singer. You’ll find a partnership that enjoys lifting up one another’s work, putting the best of themselves into every song. You won’t find harmonies that fall into a clear category—like old-time or bluegrass—but you’ll find yourself transported as you listen. The Early Mays savor the hours spent both on and off stage, and this spirit of warm collaboration shines through all of their performances and recordings. The Linden Tree Coffeehouse is located at the UU Church, 326 Main St. Wakefield, MA 01880. Doors will open at 7:30. Tickets will be $20, with those under 18, $10. For more information: www.LindenTreeCoffeehouse.org. For reservations, 781-246-2836. Eighteen-year-old Quentin Callewaert has only been on the music scene for a few years now, but he is creating a major buzz as one of the most gifted guitarists around. 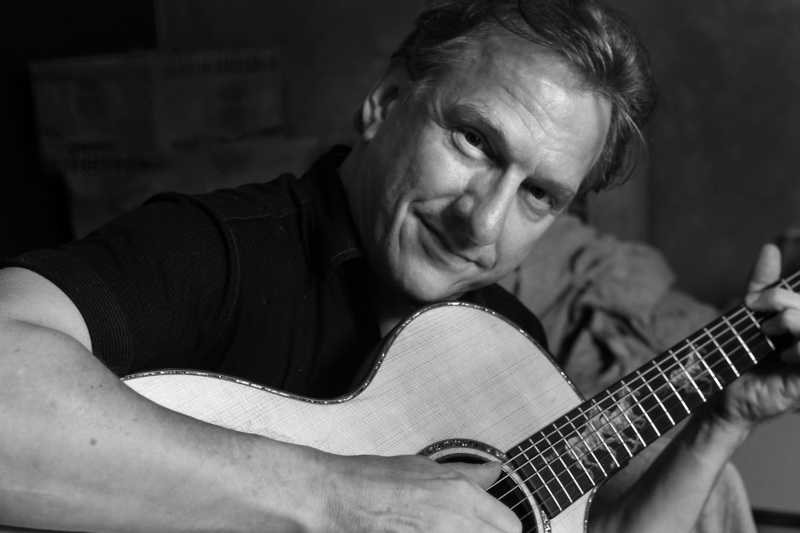 Classically trained, Quentin’s interest in fingerstyle acoustic guitar was inspired by Doc Watson, Merle Travis and Tommy Emmanuel. He is also a gifted singer with a refreshingly bluesy voice that compliments his blend of Americana, gospel and bluegrass. The songs of Brad Cole address the ups and downs of the human condition with both wit and raw insight. His passionate and distinctive delivery of roots-based folk music, woven with the grit and groove of old-school bossa and rhythm & blues moves the listener’s soul in a direction that is unexpected, yet perfectly familiar. Brad has just released his fourth full length record, entitled Lay It Down. Described by Glide Magaizine as “one of the most beautiful albums you will hear this year”, Lay it Down is perhaps Brad’s most soulfully eclectic and cohesive work to date. The last twenty-four months have been very fruitful for Brad – Playing over a hundred shows and sharing the stage with a range of immensely talented artists such as Chris Stapleton, Shovels and Rope, Ingrid Michaelson, Dave Davies, Ari Hest, Dan Navarro, Ellis Paul and Will Kimbrough. In 2015 Cole, Nakoa & Treacher was born as a side project as Brad joined forces with award-winning singer-songwriters Matt Nakoa and Robinson Treacher for a few shows that has led to critical acclaim, a viral live video series (produced by Neale Eckstein) and a run of sold-out shows up and down the East Coast. 2017 marks the launch of Brads new project Bossa Blue – the band delivers a unique dark and smokey retro lounge vibe. Combining elements of Cool Jazz, Bossa Nova, Soul & Blues over re-envisioned Standards, contemporary and classic rock tunes and in the groove originals. Cole has been a fixture on the Chicago music scene for years, performing alongside artists that make up the fabric of the citys musical legacy such as Junior Wells, Otis Rush, Uncle Tupelo and The Smashing Pumpkins. Brad led several Chicago based bands including Treatment, The Second Story and toured with NYC-based The Subscribers. 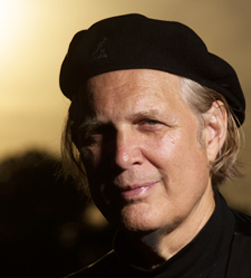 Along with singer-songwriter Jeff Libman, he is co-founder of the acoustic/soul collective known as Check With Lucy. He was also a longtime member of Chicago’s Old Town School of Folk Musics monthly Songwriters Forum. Brad continues this collaborative acoustic tradition with his acclaimed songwriter’s performance series, Acoustic Circus. Just like the long list of New York City artists before him, Robinson feeds off the honest grit found among the “huddled masses”…coupling the blatantly obvious (to a New Yorker at least) with the deeply personal. Chameleon-like in his approach to his songwriting, he refuses to be pigeonholed into one particular genre. Believing that each song is forged from its own unique terrain, he takes great pains in choosing the vehicle by which passengers might best weather the bumps, potholes, and blind curves found between the first note and the last. Admittedly susceptible to the affectations of the senses himself, he asks his audience to participate emotionally as well as physically in a “whole self ” conceptual challenge, a 360-degree soul search comprised of the most joyous elation to the bitterest of pains. There are no canvases on which to paint. There are no seminars from which to glean wisdom. There is only the note. Alone, it is just that; strung together, it is a road on which to experience life. Treacher is building this road for himself but would be the first to admit that the companions define the journey. At the crossroads of Blues, Folk and Americana lies Robinson Treacher. Whether it be in the studio or in live performance, Robinson’s emotionally dramatic songwriting style is matched only by his deeply passionate vocals. Steeped in what can only be labeled as a “traditional” songwriting format, Robinson has taken fibers from all genres. Including rock, country, R&B & folk, and woven them into a distinct tapestry, one that is clearly distinguishable among others in the singer/songwriter genre. Born and raised in New York, his honesty and grit reflect the eclectic musical influences that have shaped everything from downstate New York City to the upstate Adirondacks. On the heels of his debut release, “Chrome”, Robinson has released “Porches”, a purposefully “stripped down” collection of songs that rarely contains more than an acoustic guitar, an upright bass and of course those powerfully distinct vocals. He has shared the stage with the likes of Iris Dement, G.E. Smith, Jorma Kaukonen and Vince Gill to name a few. Robinson has been featured on Sirius/XM’s “The Loft: Live from The Living Room” series, has been a guest with John Platt on New York’s famed WFUV Radio and has recently been awarded Best Artist at Virginia’s largest Lyrics On The Lake Music Festival.. He has even been touted by legendary songwriter Don Schlitz (“Forever and Ever Amen”, “When You Say Nothing At All”, “The Gambler”) as being, “…impossible to follow in concert.” Recently, he has been nominated for a Nashville Music City Award for his song “This Bar” as well as for an NSAI/CMT country music People’s Choice Award and an Independent Music Award nomination for his song “Long Day Good Night” and is currently supporting his upcoming release “Born” with shows in NYC, Nashville, and all points in between. Lately, he has combined his talents with fellow award-winning singer/songwriters Brad Cole and Matt Nakoa forming Cole, Nakoa and Treacher. With what Elmore Magazine has called, “Drop-dead harmonies”, they have begun to tour, supporting each other’s music as well as forging a new path together. On Saturday May 11, Songwriters Cosy Sheridan and Julie Snow will share a show at Deb’s Houseconcerts in Chesham NH. The show begins at 7, with a potluck at 6:00. Songwriter and guitarist Cosy Sheridan has been called one of the era’s finest and most thoughtful songwriters. Her concerts are full of energy and her songs are carefully crafted. Backed by the strong rhythms and harmonies of her bass player Charlie Koch, she plays a percussive bluesy guitar style. Her concerts are a wide-ranging exploration of love songs for adults, practical philosophy and her signature parodies on women and aging. Julie Snow is a Boston-based singer-songwriter whose songs are infused with heart and humanity. Her early songs have been recorded by a variety of folk artists, but Julie has recently released No Ordinary Love, her second album of her own songs. Her music is funky, funny, and full of love. Julie will be opening the show accompanied by Charlie Koch on bass and harmonies.